Perfect gift choice: keep the beverages warm all day, making it a great gift for lover, dad, mom, wife, husband and all your loved ones on Valentine's day, Thanksgiving and Christmas, and other special occasions to show you care. 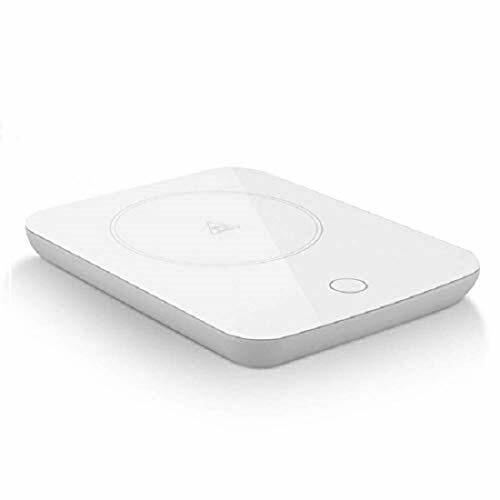 Easy to use: just turn it on and press up/down Bottom to set the temperature, making its hot plate Warm up to any desired temperature from room temperature to 110 . Keep Warm or Warm up your drink to as high as 131 /55 . Brushed stainless steel: made with high-end, brushed stainless steel, the warmer is solid, stable, and durable, and will work better and longer than other plastic versions, protecting both the warmer and the mug. 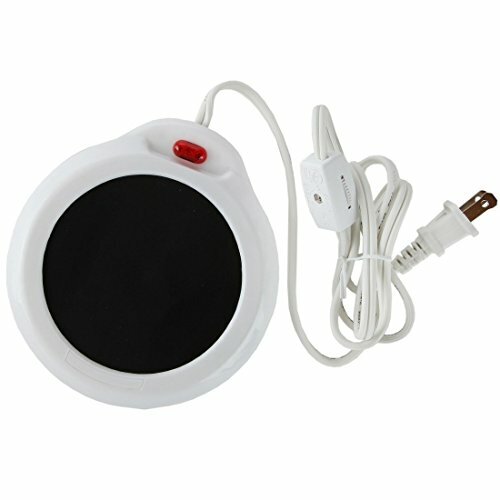 1) 19-Watt mug warmer for use with any hot beverages like coffee, tea, milk, etc. 2) Built-in gravity induction switch, just place your mug on it, it will automatically turn on, no need to turn it on/off manually. 3) Always keep your hot coffee or tea at a drinkable temperature (131 /55 ). 4) Adopt waterproof design, easy to clean, FCC & UL certificated, safe and reliable. 5) Stylish and compact design, easy to carry, you can place it on your working desk or bedside table for your hot coffee or tea. 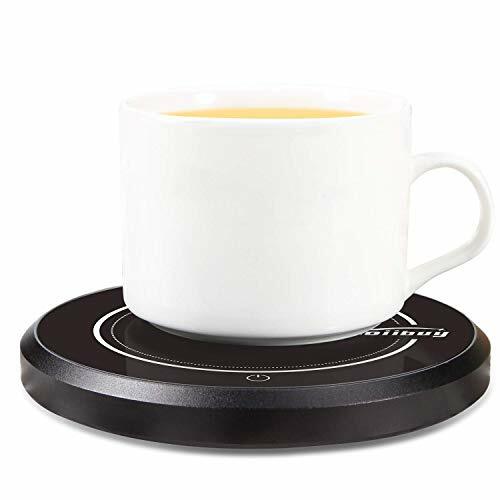 Notice: This mug warmer plate is capable of keeping your hot beverages warm enough for drinking when you used a suitable mug, please do not expect it to heat your cold beverages to scorching hot in a short time. It is designed with low power consumption to keep your hot coffee or tea always warm. Please contact us freely if you get any questions or issues when using it. Thanks for your understanding. 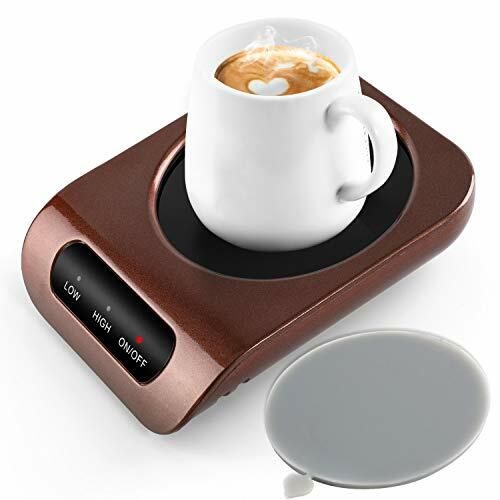 Easy To Use: 19-Watt mug warmer for use with coffee, tea, milk, hot cocoa and more, built-in gravity induction switch with indicator light, no need to turn it on/off manually, warm your beverage at a desirable temperature (131 /55 ). 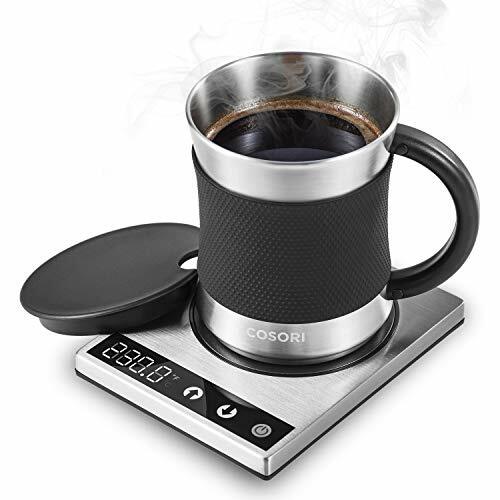 For Suitable Mug: A thin-walled, flat-bottomed mug will have the best warmth retaining performance, the weight of your mug needs to be over 0.5lbs to activate the gravity induction switch. 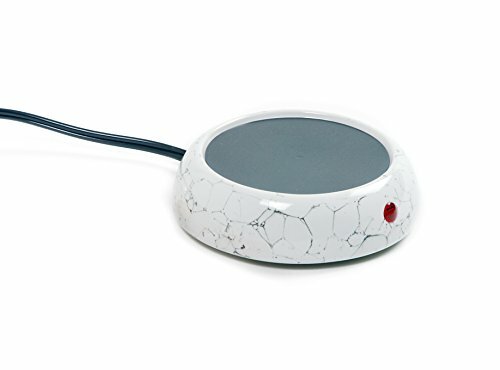 Waterproof Design: The heating plate was covered with a layer of thermal conductive glass without need for security concern for occasional spill and it is easy to clean. Safe & Reliable: FCC & UL Certificated, backed by our 24-months warranty, get this coffee warmer risk free. Best Gift Choice: Beautiful and compact design, keep your beverages always warm, it will be your best gift choice to show your care to your families, lover or friends on Valentine's Day, Thanksgiving, Christmas or other special occasions. There's no need to suffer through sipping cold coffee or lukewarm tea, just because you're too busy for a refill. Now, it's easy to keep hot drinks steamy and close at hand! The desktop coffee mug warmer is the hottest item in the office! This fantastic coffee mug warmer features a sleek, low-profile design made from durable lightweight components, with a 3.5" diameter heating surface at the center. Simply place a ceramic mug filled with hot liquid directly onto the heating surface, and marvel as the beverage stays warm continuously. The Mug Warmer features a convenient on/off switch on the cord, and a bright red power indicator light on the body. or keep a cup of hot tea steamy while you relax on the couch. The Mug Warmer is the perfect companion to any hot drink! Pour cold coffee down the drain, and stay steamy instead! Bring home your Desktop Coffee Mug Warmer today! Measure: 5.25" Diameter x 1" H; Heating Surface Area: 3.5" Diameter; Total cord length is about 42". On/off switch is at 15" from the hot plate. USE AT HOME OR IN THE OFFICE - Keep the morning coffee hot at your desk while you work, or keep a cup of hot tea steamy while you relax on the couch. An Upgraded Set: Newly-released Coffee Warmer & Mug Set! After designing one of the best-selling coffee warmers on Amazon for over a year, we're offering even more. Better thermal conductivity, premium quality. Perfect for keeping beverages warm all day. 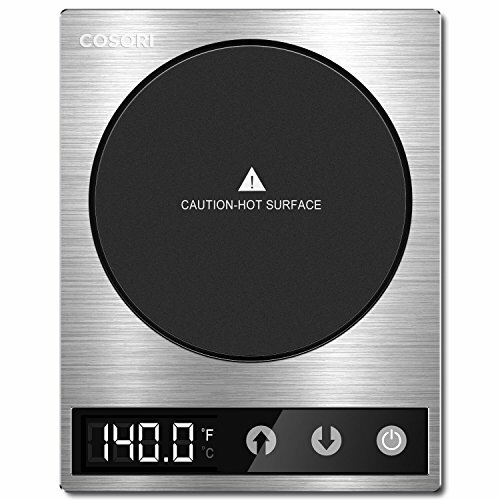 High Tech Details: Cosori's stainless steel coffee warmer features touch-tech controls, an LED display, and a water-resistant plate. Easily switch between F and C. Temperature readings of the warming plate are precise down to 1 degree. User-friendly design makes it easy to use. Matching Mug: FDA-approved and food-grade 304 stainless steel 17oz mug is built with a cool-touch handle, a silicone slip-resistant sleeve, and a stylish brushed finish. Flat mug bottom makes full contact with the warming plate to keep your coffee cozy. Cosori mugs are available for purchase (search for C1601-CM). Reliable and Durable: A high-tech PI film heating element allows the plate to go up to 230 F. Beverage temperatures will range from 77 F to 158 F (plate and beverage temperatures vary due to thermal balance). High-end stainless steel is durable and long-lasting. Satisfaction Guaranteed: FCC/UL-approved adapter. Compatible with 100V-240V outlets. 1-year buyer assurance (with the option to extend it by 1 extra year). From video tutorials to emails and calls, our team in Southern California provides excellent lifetime support with purchase. There's nothing more disappointing than a cup of coffee that's gone cold. But who has the time to keep reheating it again and again? Now you can stop the worry of hot beverages going cold with the Misby Electric Coffee cup Warmer. Why Chose Misby Coffee Cup warmer? the warmer will turn on& off auto, you can enjoy coffee at you leasure. This coffee cup warmer can Keep your favorite mug of coffee, tea or cocoa hot when you want it. Where you can use this cup warmer? Keep the mug by your side constantly at the temperatures you like. Even if you have tasks to take care of around the house, you can still enjoy the mellow hot coffee. Sip at warm or hot coffee all day, no longer worried about being interrupted by reheating coffee again and again. 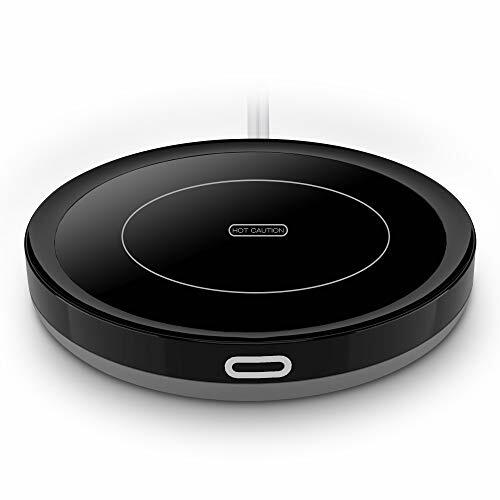 Most thoughtful and practical gift for father's day, birthdays, thank-yous, holidays, and other special occasions to beloved family members, dear friends,lover as great partner at work and home. 100% Money-Back Guarantee: The coffee cup warmer enjoys 45 days money back and 12 months warranty. Purchase with worry free! Here's to taking time to relax with your tea and coffee as long as you want, every day!! You deserve it!!! Measures: 5 x 5 x 1.5 / 13cm x 13cm x 4cm. Great for use at the office, home, dorm and travel! Heated plate keeps your mug warm, so you can take your time and enjoy your cup of coffee, tea, hot cocoa and other hot beverages. Nonstick heating element measures 3.75 / 9.5cm and easily wipes clean. Includes on/off switch with neon light indicator. Extra long 60 / 152cm cord! 120 volts / 24 watts. UL approved. Norpro was founded in 1973 with a vision to design, manufacture, and supply the highest caliber kitchenware. Norpro s offering of innovative, high quality product for cooking, preparing and serving food are produced with superior materials and craftsmanship. Great for use at the office, home, dorm and travel! 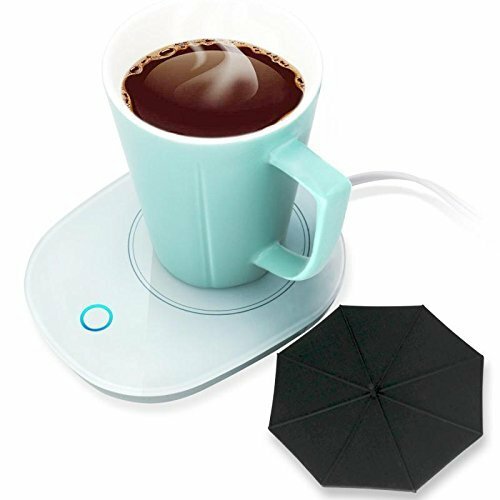 Heated plate keeps your mug warm, so you can take your time and enjoy your cup of coffee, tea, hot cocoa and other hot beverages. Nonstick heating element measures 3.75 / 9.5cm and easily wipes clean. Includes on/off switch with neon light indicator and an extra long 60 / 152cm cord! 120 volts / 24 watts. UL approved. 1. It usually takes nearly 1.5h to release a 8.8oz candle's fragance and let it fulfill about 323 square feet room. 2. The diameter of candle cannot be over 4inch, only in a glass, ceramic or tin. 4. The candle still can be lit after melting. [ Smarter and Safer Candle Warmers] - Allow you to enjoy the fragrance of a lit candle, without flame, soot, or other pollutants. [Applicable]-Can hold Yankee, 3 wick candle for bath&body,Homesick, Chesapeake Bay and any candle in a less than 4inch glass. [Safty] -Made up of high-grade fireproofing materials and felt covered feet in the bottom, it is very safe when being used. Did you had a bad experience, when you wanted to have hot coffee BUT it turned out to be cold? But who has the time to keep reheating it again and again ? Now you don't have to, with the coffee cup warmer for desk. Never sip cold coffee again. remove the mug warmer plate will turn stop heating. We have all the safety standards, 15W Low Power and UL Wire. Instructions 1: Full cup of liquid. Put the cup in the middle of the warmer's heating area, the micro-gravity sensor will heat automatically. Instructions 2: Less than half cup of liquid. Move the cup near micro-gravity sensor but cannot leave the warmer's heating area. Instructions 3: Small amount of liquid on the cup. For your safety, the warmer will power off automatically. Coffee heater is a great product that you can use it all the season, just for your enjoyable life. SAFE AND RELIABLE: This coffee heater with 16W low power, make the tea warmer heat-resistant and fire resistant, allowing it to evenly warm beverages while remaining safe and stable. Please don't expect coffee warmer as a heater or keep your coffee super hot. Life of up to one hundred thousand hours. WATERPROOF DESIGN: Don't worry if you spill liquid on your coffee cup warmer plate by accident,because it is WATERPROOF. Mug warmer for desk have waterproof panel is adopted without need for security concern, as you just need to dry it with a rag. Note: Do not pour water onto it. USEFUL&30-DAY 100% MONEY-BACK GUARANTEE: Can be used in different occasions(home,office) with different material cups(glass,stainless steel,enamel) for different beverage(tea,coffee,milk,cocoa). Buy your hot mug warmer without risk. If you're not thrilled for any reason, just return it for a full, no-hassle refund. We all know the most important reason that we get a mug warmer is to keep beverage hot or cloes to hot. 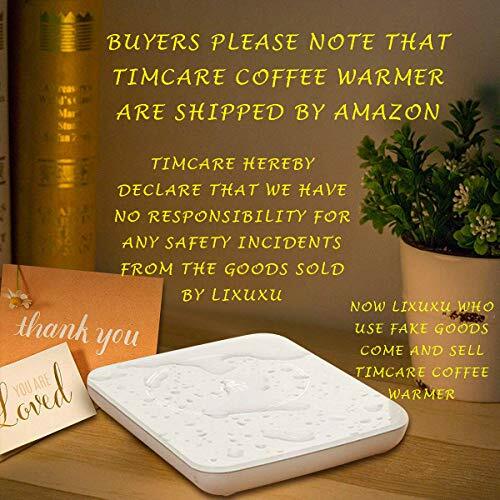 Except that, Timcare Coffee Warmer has below extra advantages for you to purchase. Disclaimer: Be sure to not mistake this warmer as a cooktop! If you have a hot cup of coffee you don't want to goo cold, that's what we're here for-Maintaining temperatures, Not heating up leftovers. Safe and Stable: Using High Tech Polyimide(pl) Film as mug warm heating surface, it keeps cup warmer heat-resistant and fire-resistant. It also has 4 non-skid feet at the bottom to support your mug and prvent spills.Suitable for tableware: metal, ceramic, enamel, tile, high temperature plastic, glassware etc. 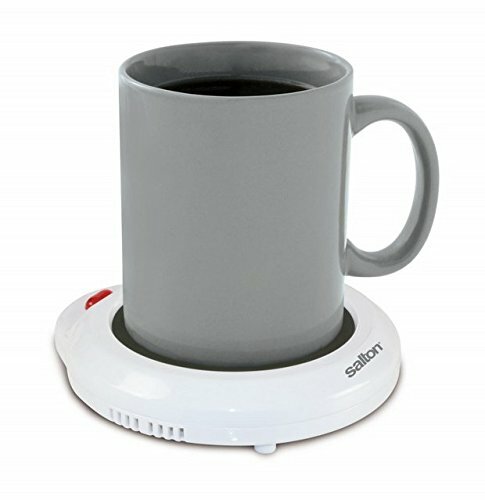 The Salton mug warmer keeps a full cup of coffee, tea, soup or any other beverage at the ideal drinking temperature. DOES NOT INCLUDE THE MUG. TWO MODES & AUTO-SHUTOFF: The coffee cup warmer can warming in high-temp and low-temp mode, with a auto-shutoff function after continually working 4 hours. WATERPROOF FUNCTION: Made of toughened glass and aluminium alloy, this mug warmer has a smooth surface that easy to clean. It can also work with a waterproof function. STYLISH DESIGN & CONVENIENT OPERATION: The electric mug warmer is designed with a touch button that you can operate it as touch your phone screen. WARMER OBJECT & FLAT-BOTTOM MUG: With a power of 18watt, Suitable for coffee, tea, milk, Cocoa, water, etc. Please use it with glass, ceramic, iron, and steel mugs. For better insulation, please use the flat-bottom mug (sold without mug). MULTI-PLACE APPLY & IDEAL GIFT: The coffee warmer can work for desk use in office and home. This set of 2 electric mug warmers are the perfect solution for keeping beverages warm at home or the office. 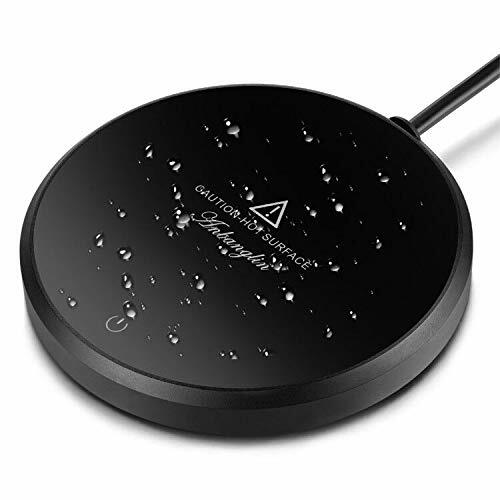 The heated plate provides a safe and simple way to maintain the temperature of your coffee, tea, cocoa, or mug of soup so you can enjoy it at your leisure. Easy to use: the on/off switch allows you to keep the electric beverage heater plugged in and sitting on a desk or counter when not in use. Indicator light lets you know when it's turned on for warming. Makes a great gift for family, friends, or coworkers that are coffee and tea lovers.It can also be used to warm scented candle waxes that require steady, low heat. This durable product has a sleek silver finish, with a non-skid bottom to stay firmly in place and prevent spills. Approximately 5.25 inches in diameter and 1 inch high, and will accommodate mugs and cups with a base diameter of up to 3.25 inches. Cord measures approximately 56 inches long. For use with ceramic or glass mugs only. Recommended for use with ceramic or glass mugs only. This set of 2 electric mug warmers are the perfect solution for keeping beverages warm at home or the office. 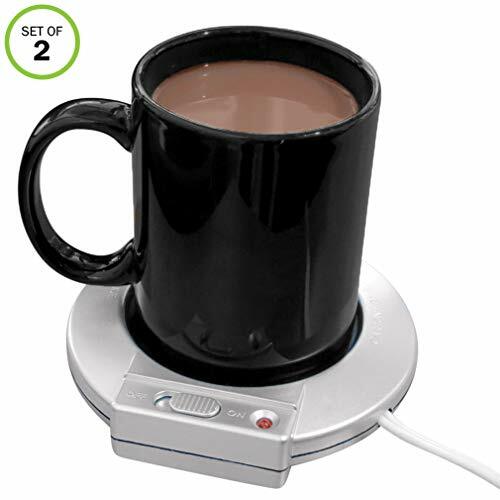 The heated plate provides a safe and simple way to maintain the temperature of your coffee, tea, cocoa, or mug of soup so you can enjoy it at your leisure. The on/off switch allows you to keep the electric beverage heater plugged in and sitting on a desk or counter when not in use. Indicator light lets you know when it's turned on for warming. Perfect for family, friends, and coworkers who are coffee and tea lovers. Can also be used to warm scented candle waxes. Durable and sleek, with a non-skid bottom to provide stability and prevent spills. Approximately 5.25 inches in diameter and 1 inch high, and accommodates mugs and cups with a base diameter of up to 3.25 inches. Cord measures approximately 56 inches long. For use with ceramic or glass mugs only. make sure you have your mug bottom in full contact. Deliciously Warm to the Last Drop! If you're tired of looking for the elusive flat-bottomed mug that most heaters require, you're in the right place. With an included aluminum pad for better conductivity, Voolta Espresso Heaters: Keep beverages deliciously warm all day long Have no complicated settings to fiddle with Work with all kinds of cups, glasses, and mugs Have a modern design suitable for any decor Don't take too much space on your desktop Make for smart gifts for friends and family *This electrical warmer keeps liquids warm without re-heating them. The end results depend upon the room temperature. For warmer drinks, cover your mug/cup. 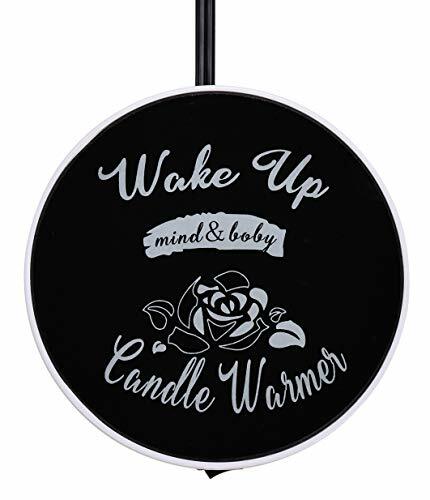 Teacup flat warmer Wine or sake warmer Fragrance diffuser Hot cocoa warmer for desk Scented candle warmer Wax candles jar warmer Essential oil candle warmer Quality at Its Best! Automatic turn on/shut off to save power Fast warming at 122-131 F (52-55 C) Long power cord for ultimate convenience Spill proof design to prevent damages Anti-slip feet to keep the pad stable while in use Cool On/Off light indicator Buy Your Individual Cup Warmer Now and Keep Your Coffee Deliciously Warm to the Last Drop! CONSTANT TEMPERATURE - With Voolta Coffee Warmer you'll never have to re-heat your coffee ever again! Also usable as a candle warmer with automatic turn on/off, this remarkable gadget keeps your favorite beverages at just the right temperature all day long. 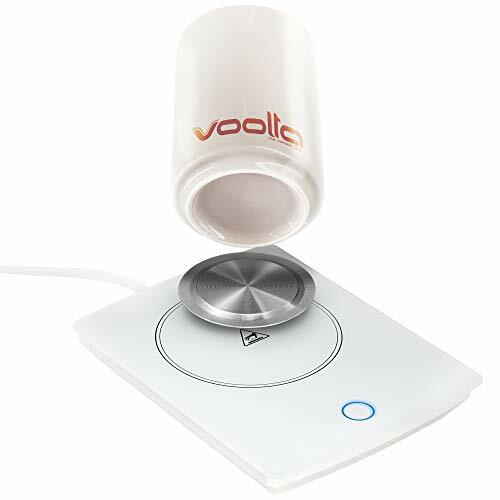 WORKS FOR CONCAVE MUGS - If you're tired of looking for flat-bottomed mugs, you'll love the aluminum pad that comes with Voolta Drink Warmer. Just place it between your cup and the mug warmer and your coffee will stay deliciously warm to the last drop! MULTIPURPOSE DEVICE - Whether you need a tea warmer or a soup warmer, Voolta Beverage Warmer is perfect for you! Providing above average heating power for its price range, this hot chocolate warmer keeps all liquids warm at 122-131 F (52-55 C). MINIMALIST DESIGN - The deceptively simple design of Voolta Desk Top Coffee Warmer looks spectacular in any decor. As a bonus, this white cup warmer features a long power cord, so you can plug it in at your desk even if the nearest outlet is just out of reach. 1 YEAR GUARANTEE - Voolta Milk Warmer is ultimately designed to help you enjoy deliciously warm beverages all day long. If you don't absolutely love your electric warmer, just send it back for a hassle-free refund of your purchase money! Be sure to not mistake this warmer as a cooktop! If you have a hot cup of coffee, you don't want it to got cold, that's what we're here for - Maintaining temperatures, Not heating up leftovers. SUITABLE CUP: For a better heat transfer, we suggest using steel flat and thin bottom mug for the best performance rather than a concave bottom. WATERPROOF: Mug warmer has adopted the waterproof panel, don't worry spilling on the plate.Just dry it with a rag if spill happens. Note: DO NOT POUR WATER ON IT. PERFECT GIFT: Keep the beverages warm all day, making it a great gift for Dad, Mom, Wife, Husband and all your loved ones on Birthdays, Thanksgiving and Christmas,and other special occasions to show you care. Say goodbye to lukewarm coffee and cold beverages! The heating plate provides a safe and easy way to completely warm your coffee, tea, cocoa or a large cup of soup, allowing you to enjoy it while you are away. Feature Keep the Water Warm Slow down the cooling rate of the water. The temperature can be maintained at 40-80 Unique Thermal Design The unique symmetrical diverging vents on the bottom are designed; at the table, the heat on both sides dissipates. Waterproof, Easy to Clean Metal waterproof panels do not have to worry about occasional spills. Wipe the surface of the coffee heater with a clean cloth or towel for your next use. Suitable for All Drinks Insulation cups are suitable for warm mug water, milk, coffee, tea, soup, cocoa, chocolate and other beverages. Specification: 1. Material: ABS plastic + electronic components 2. Color: Black 3. Power: 6W 4. Current: 5V 5. 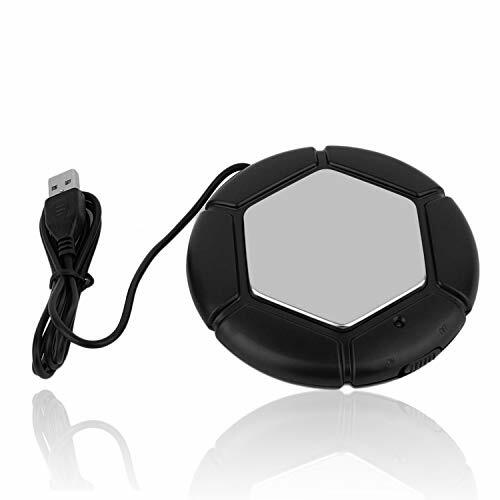 Charging mode: USB interface Package Included: 1* Desktop Mug Warmer NOTE 1. After using for one hour, please pay attention to the heating zone to avoid burns. 2. If not used for a long time, please turn off the vacuum flask. 3. Please stay away from your little baby. Good Service We promise that we are committed to create high-quality products and should you have any problems about our products, don't hesitate to contact us. HIGH QUALITY : Made of ABS plastic and electronic components, it is heated quickly and easy to wipe clean. SAFE AND SIMPLE OPERATION : A simple on/off switch on the power cord allows you to plug in the electric beverage heater and sit on the table or counter when not in use. The indicator light lets you know when to turn it on for warming. RUGGED DESIGN: Made of sturdy plastic with a smooth silvery finish and black heated surface. Padded feet at the bottom help support your cup and prevent spillage. WIDELY USED : For coffee, tea, hot cocoa and any other beverage that needs to be heated in the home, office or outdoors. AFTER SALES SERVICE : We are so confident with the quality. We make sure that you are 100% satisfaction. If for whatever reason you are not completely satisfied, just contact us by email right away.